The report by Persistence Market Research provides an in-depth analysis of the global edible oils market for the forecast period 2017-2024. The primary objective of this report is to provide key insights on the latest developments in edible oils market. The report also offers information on market dynamics that are likely to influence the growth of the global market on edible oils market throughout 2017-2024. The report also provides updates on key trends, market drivers, challenges, and growth opportunities in the global edible oils market. The report focuses on all the important factors resulting in the market growth and the factors that are expected to drive the demand for edible oils. The report also offers information on all the driving factors and restraints that are driving the growth of the market. Various factors are likely to result in the growth of the market in the coming years. The report also focuses on how the companies are competing in the market and contributing towards its growth. Factors that are shaping the global market internally and externally are also given in the report. 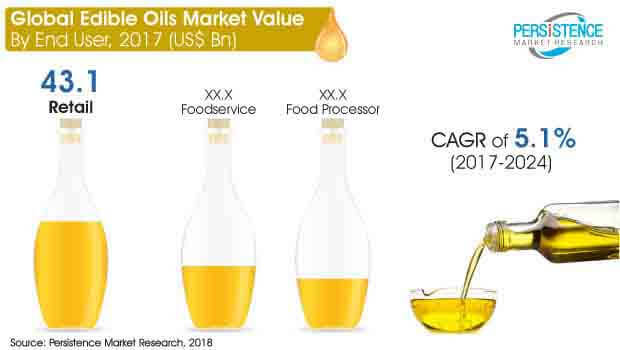 The competition in the edible oils market is also high owing to the increasing number of companies providing edible oil products, along with small companies and new entrants in the global edible oils market. The information on sales and demand of edible oils is also given in the report to help in identifying key growth opportunities in the market. The report also provides detail on the market share of the global edible oils market based on the key segments and region. It also includes information on the latest techniques used by manufacturers. One of the sections in the report also highlights the global demand for edible oils based on segments and regions. The market is segmented on the basis of type, end user, and region. The report provides in-depth analysis on the market for the forecast period 2017–2024 and also offers information on all the strategic developments, new products and regulations on the global edible oils market. This report also analyzes all market drivers that are contributing to the market growth in all the key regions. Regions in the report include Asia Pacific (APAC), Europe, Latin America, the Middle East and Africa (MEA), and North America. The report has been developed on the basis of primary and secondary research. Both primary and secondary research includes annual, financial reports, and investor’s presentation. The interviews were also conducted with market experts to gain insights on what is the current scenario in the market. The last section of the report includes information on the key companies operating in the global edible oils market. The report also provides a dashboard view including product portfolio, business and financial overview, latest development, and advanced technologies used. The report also covers information on the are retailers, raw material suppliers, and manufacturers. The report offers forecast in terms of CAGR, revenue, and year-on-year growth. This helps in understanding the market better and also to identify opportunities in the global edible oils market. Edible oils are among the widely used ingredient and considered essential in preparing food items. It is consumed by people and also has an impact on their health. Increasing incidences of chronic diseases such as heart disease, obesity, people are moving towards adopting more healthy option including omega-3 fatty acids that minimize the risk of chronic diseases. Hence, manufacturers are also focusing on the research and development of edible oils that can cut the risk of various diseases and also help to fight the problem of obesity. Majority of the people are moving towards consuming monounsaturated and polyunsaturated edible oils such as peanut oil, olive oil, sunflower oil, and walnut oil. Most of the countries have set various standards to ensure the authenticity of food and labeling. These standards have been set to avoid adulteration, including the dilution of commodity with a less expensive material. Various incidents of oil adulteration have also occurred in the past, hence, governments of various countries have introduced stringent regulations on production and labeling of edible oils. As per the report by Persistence Market Research (PMR), the global edible oils market is expected to witness a steady growth throughout the forecast period 2017-2024. The global edible oils market is also estimated to bring in US$ 130.3 Billion revenue by the end of the forecast period. Compared to the food processor and food service industry, retail sector is likely to be the largest end user of edible oils. Owing to the changing consumer preference, and improving the standard of living, consumers are opting for more healthy edible oil options. The edible oil industry is also witnessing a rise in the consumption of premium oils including canola oil, olive oil, mustard oil, and soybean oil. Oil is used a main ingredient in cooking in the Asia Pacific region, especially in India and China, hence, the demand for edible oils is increasing. Along with the production, companies are also focusing on the packaging of edible oils to lead to zero wastage. Advanced techniques for processing are also being adopted by manufacturers to offer edible oil at an affordable rate. Manufacturers of edible oils are also moving towards merger and acquisition to expand in the global market and establish the business in the country where demand is high. Meanwhile, increasing popularity of new food items and packaged food products is also driving the demand for edible oils in the Asia Pacific region. The consumption of palm oil is increasing as it is one of the cheapest forms of vegetable oil. Hence, it is finding large application in various food processing companies. Moreover, it is consumed on a large scale in developing countries due to its affordability. Also, it is being used widely as a feedstock in the biofuel production. The major consumers of palm oil are India, Indonesia, and China. Indonesia is also focusing on expanding the area of palm oil plantation. Meanwhile, the government in Indonesia is also focusing on more sustainable palm oil production in Indonesia.